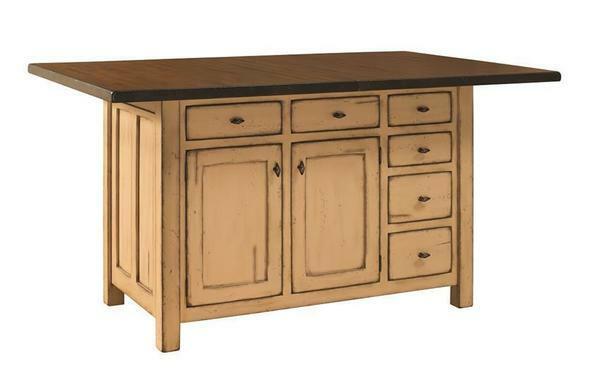 Your kitchen will be the heart of the home with this new Amish handcrafted kitchen island. Family will gather during prep time or to work on homework at this beautiful island. You will get plenty of storage with this Amish Mission Kitchen Island as well as leg room underneath the top to accommodate bar stools and benches. Pair this kitchen island with our Clifton Stools and Bench as shown in the picture. Two extensions are included to expand the top creating a great eat in spot in the kitchen or a place to just hang out and talk. The 12" extensions store inside of the kitchen island top. Order the kitchen Island as shown with the base built in brown maple wood and finished with our taupe paint that is antiquated and heavy distressed. The island top style is also brown maple wood with our rich tobacco stain and hand planed feature. You can transform the look by going with our many wood, finish and hardware options for this kitchen island. This superior Amish-made, American Kitchen Island is backed by a 20-Year Limited Warranty to protect you against material and workmanship-related defects. Call toll free to discuss this Amish Kitchen Island with a live DutchCrafters Amish furniture specialist today at 1-866-272-6773 or visit our Florida Amish furniture store. Overall Height with Top: 36"
Other Top Sizes Available: 30" x 66", 36" x 52", 36" x 66"